Aws Med is the acoustic wave technology for medical aestetic treatments with Medical Certification. Aws Med features many therapeutical protocols for men and women, specific for different beauty applications, like cellulite, water retention, stretch marks, localised adiposity and also 32 physiotherapy protocols. 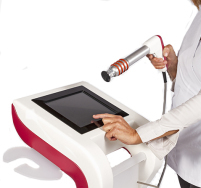 Acoustic wave equipment of EME ESTETICA features the Soft Rebound System, an anti-shock system that eliminates the shock-wave vibrations received by the operator. Aws Med treatments can be applied at any period of the year. 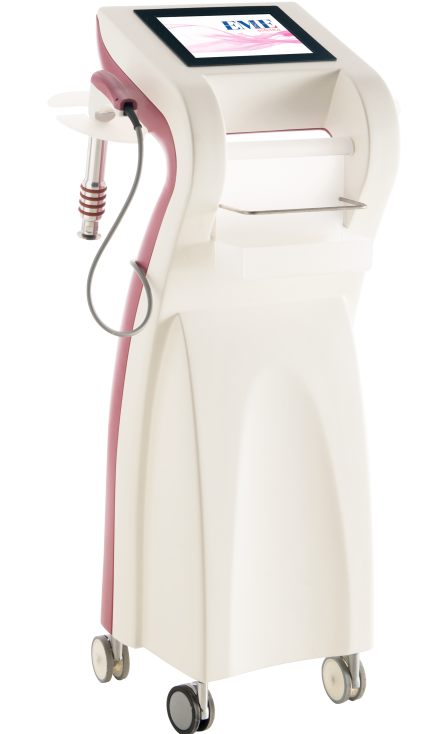 The acoustic wave technology is an innovation in the beauty sector that allows to deliver tapping massages with a gun-shaped applicator. In the barrel of the applicator a steel gun is shot continuously against an internal metal lid. The continuous hitting of the shot against the metal lid generates a vibration that is conveyed to the skin during the treatment. Acoustic waves spread by contact of the applicator with the skin; they activate and stimulate numerous beneficial processes in the human body. The software shows on a wide display the shots delivered during the treatment. You can regulate pressure and frequency of the acoustic wave. You can regulate pressure and frequency of the acoustic wave. To increase the sliding of the applicator on the body it is necessary to use the gel supplied with the equipment; it will make the treatment easier for the operator and it will provide a fresh sensation to the patient.